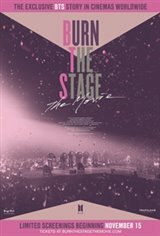 Burn the Stage: the Movie is the first movie from BTS, going behind-the- scenes of the BTS WINGS TOUR to reveal the full story of the band's meteoric rise to fame. This unmissable cinema event provides an intimate look at what happens when the most successful global boyband of all time breaks down barriers and invades the mainstream music scene. Exclusive tour footage and brand-new one-on-one interviews with BTS members give fans an unprecedented glimpse into their lives and an opportunity for everyone to celebrate together in movie theaters worldwide.